In this study we examined the role of sorghum flavonoids in providing resistance against corn leaf aphid (CLA) Rhopalosiphum maidis. In sorghum, accumulation of these flavonoids is regulated by a MYB transcription factor, yellow seed1 (y1). Functional y1 alleles accumulate 3-deoxyflavonoids (3-DFs) and 3—deoxyanthocyanidins (3-DAs) whereas null y1 alleles fail to accumulate these compounds. We found that significantly higher numbers of alate CLA adults colonized null y1 plants as compared to functional y1 plants. Controlled cage experiments and pairwise choice assays demonstrated that apterous aphids preferred to feed and reproduce on null y1 plants. These near-isogenic sorghum lines do not differ in their epicuticular wax content and were also devoid of any leaf trichomes. 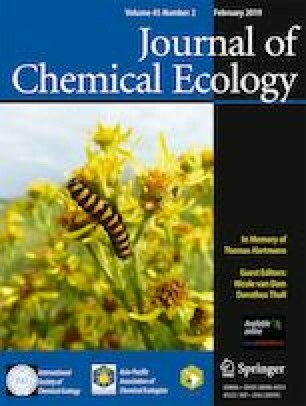 Significantly higher mortality of CLA was observed on artificial aphid diet supplemented with flavonoids obtained from functional y1 plants as compared to null y1 plants or the relevant controls. Our results demonstrate that the proximate mechanism underlying the deleterious effects on aphids is y1-regulated flavonoids which are important defense compounds against CLA. Rupesh R. Kariyat and Iffa Gaffoor contributed equally to this work. The online version of this article ( https://doi.org/10.1007/s10886-019-01062-8) contains supplementary material, which is available to authorized users. This work was supported by a USDA/NIFA award 2011-67009-30017, AES awards PEN04430 and PEN04613 to SC, and start up research funds from UTRGV for RK, and an Undergraduate Research Award, Penn State College of Ag. to Cullen Dixon. We thank Dr. Hari C. Sharma for his expertise and suggestions on this study, Thomas Eubanks for assisting with electron microscopy, Scott DiLoreto for greenhouse management, Scott Harkcom for tending sorghum nurseries at Penn State Agronomy farm, Dinakaran Elango with sorghum seed multiplication, and Kameron Wittmeyer for critical reading of this manuscript. We also wish to express our gratitude for annonymous reviewers for their constructive criticisms to help finalize this manuscript.